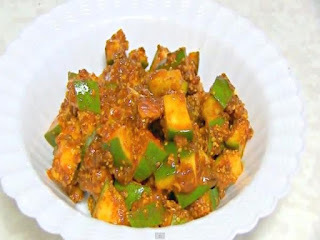 Mango pickle refers to a variety of pickles prepared using mango.This is a very popular pickle in South Asia and India. These spicy pickles are also available commercially. Peel the skin Of Raw Mango. Cut the Peeled Raw Mango Into small pieces. Put Red Chilli powder, Turmeric powder, Yellow Mustard seeds, Salt, Saunf and Mustard Oil. Fresh Raw Mango Pickle is ready to serve. Cuisines listed in this site are based on the principles of Vegetarianism shaped by Hindu and Jain beliefs.All the dishes here are mainly by Mrs. Vinita Jain,Housewife with cooking experience of more than 30 years. The recipe of the dishes are listed keeping in mind easy preparation, so that people with less cooking experience can also make it easily. Indian cuisine encompasses a wide variety of regional cuisines native to India.Many Indian dishes are cooked in vegetable oil, but peanut oil is popular in northern and western India.Cuisine differs across India's diverse regions as a result of variation in local culture, geographical location (proximity to sea, desert, or mountains) and economics. It also varies seasonally, depending on which fruits and vegetables are ripe.